Following the triumphant reception of the six ground-breaking London Symphonies 93-98 during his first visit to England, Joseph Haydn was at the height of his fame when he embarked on his trip back to Vienna in July 1792. Although he had planned to return to London within six months, Haydn�s second visit to London was delayed for an entire year. In the meantime, he continued to compose, and finished his Symphony No.99 in Vienna in 1793. 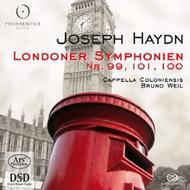 Symphonies 100 & 101 were completed in 1793/4. Bruno Weil and the Cappella Coloniensis (founded in 1954) inspire with an enthralling and intelligent performance in the third release in this enterprising 'London Symphonies' series. Includes a bonus 'explanations' CD presented by Bruno Weil.